July 3, 2011 – After the bilingual Joint Worship Service and Annual Congregational Photo, this year's church picnic was held on the church grounds under beautiful, sunny skies. We enjoyed each other's company amongst a potluck of salads and barbecued wieners while listening to the piping of "Happy Birthday" in celebration of the Vicar's special day. photo, before continuing on to the Annual Church Picnic. 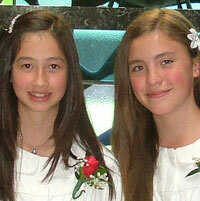 June 12, 2011 was Confirmation Day for two young ladies at Trinity. 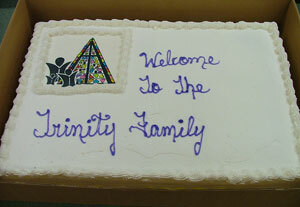 Welcome to the Trinity Family! Trinity Tigers say "Thank You!" 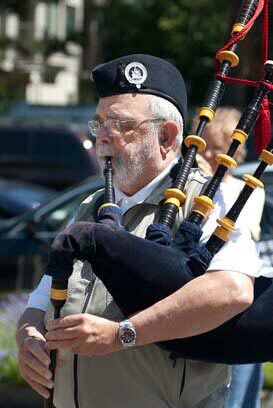 June 2011 – Our season wrapped up over the June 25-26 weekend at the Festival. We had another great season and again had the most "runs for"! A big THANK YOU to all our fans for your support and cheers during the regular season, at our fundraiser and at the Festival! See you next season! 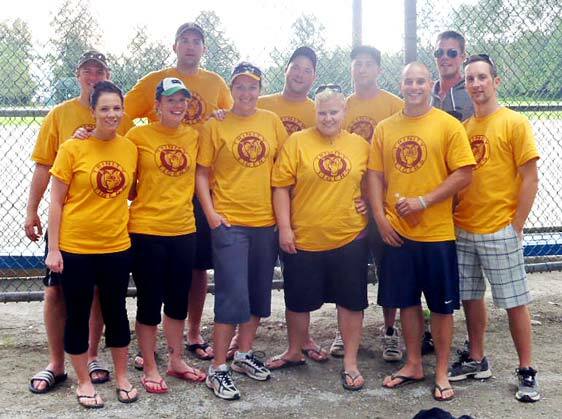 Thanks to all who took part in our Fundraiser on June 5 when the Tigers challenged the Board of Directors! We raised $350 for the purchase of a BBQ which will be matched by FaithLife (Tigers covered the cost of food through extra team fees). Click here to see gallery of the day's photos. Vicar Zhang is nearing the end of his 1-year vicarage and will soon become a "Pastor". We have also learned that ABC District has placed him at Trinity so he can be an Associate Pastor here. An installation and ordination service will take place during the summer (more details to come later). Congratulations, Vicar Zhang! And, again, welcome to Trinity! We love having you here! Beginning on Sunday April 17 (Palm Sunday), Pastor Harold will begin a new Sunday morning Bible class entitled – Jesus: Legend or Lord? Each class will begin with a 20 minute DVD presentation by world renowned scholar Dr. Paul Maier, followed by Bible passages & discussion questions. This new class examines proofs of Jesus’ resurrection as well as gives convincing support for our Christian faith from archaeology, history, & geography. This is a timely series that answers the questions of those who are curious and addresses the claims of modern skeptics. This is a drop-in class, every Sunday at 9:30 am. Feel free to come any Sunday morning and take part. Visitors always welcome! What to do with your "Old Laptop"? January 25, 2011 — In May 2010, the Trinity Quilters once again participated in BC Baling Day, a special event to gather quilts, school supplies, baby kits, and so on, from Lutheran congregations all over British Columbia. These items are all sent to Abbotsford in May to be baled by volunteers and placed inside a shipping container. Canadian Lutheran World Relief (CLWR) identifies an area in need and ships the container there. In 2010, the shipment went to Mauritania. A report from CLWR with photos is below showing that the quilts and other items were distributed to almost 4500 people in need of aid. If you would like to know more about the Trinity Quilters, please click here. Bamboo? -- We need lots of bamboo!!! 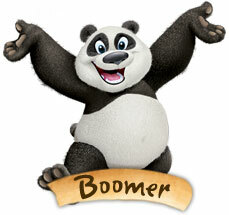 This summer we need lots of bamboo for decorations at this year's "PandaMania" VBS! If you have bamboo in your garden, grow some extra for VBS. Chinese decorations are also needed. Contact DPS Don or Ewald for more info. "PandaMania" --- Where God is Wild About You! As our congregation is continually adding new faces, plus information for a number of families is changing, an updated directory will again be published. Please provide the office with any personal contact and family changes since the last printing of the directory. In particular, provide any changes to addresses, phone and cellular numbers and email addresses. Thank you! UPDATE: The directory will be ready for distribution on/after December 26. Please see the Office Secretary to get your copy. December 1, 2010 — Go to Father's Love Letter and watch this 10 minute video. It is a selection of nearly 50 paraphrased Bible verses from Genesis to Revelation that describe God's love for us: who He is and what we mean to Him. Presented in the form of a love letter. Enjoy! November 12, 2010 — You may remember KD Lang's moving presentation of Leonard Cohen's "Hallelujah" during the opening ceremonies of the 2010 Winter Olympics. Well, in 2006 a young lady from Prince Edward Island adapted the lyrics to reflect the Easter Story and Jesus' journey to the cross. She recently received "mechanical rights" to the song so she could record it. Ever wonder about the history of the Bible? When was each section written? How many authors wrote and how many languages were the original texts written in? How many versions and translations are there? When did the Bible get reorganized into Chapters and Verses? How do we know if today's versions of the Bible are true and faithful to the original writings? For answers to these questions and many more facts, watch the video series How We Got the Bible. Five online videos of approximately 6 to 10 minutes each. You may have heard the news of Stephen Hawking's most recent revelation in his book "The Grand Design" that God was not needed to create the universe but the universe began through "spontaneous creation". Rev Ken Klaus presents some key counter arguments and questions to think about in another entertaining 6-minute video episode of The Baloney Shop. Aug 18, 2010 -- As the flooding in northern Pakistan continues and millions are homeless and suffering, Lutheran Church–Canada is launching an emergency appeal for funds to assist in relief work. We're still in the middle of summer and enjoying great weather on the West Coast. While it may seem early and a long way off, mark your calendars for some important dates. On September 5th, the Sunday morning worship service returns to 11:00 am, and the following Sunday, September 12th, all Sunday morning classes start up again at 9:30 am. Make it part of your family's plans to attend Adult Bible Study, ESL Bible Class, and Sunday School. All of our classes are open to both members and visitors, so please feel free to drop-in and learn something new about God's Word. On Thursday, September 16, Infant & Toddlers Drop-In resumes from 9:30 am to 11:00 am. All younger children and their caregivers are welcome to stop by every Thursday morning for playtime, Bible Stories and fellowship. We look forward to meeting you! In addition this year, we welcome Vicar Wayne Zhang to Trinity's staff. Vicar Zhang and family are from St Catherine's Seminary in Ontario. On September 12th, Vicar Zhang will be formally inducted during the 11:00 am Worship Service. Please come and welcome Vicar Zhang to our Trinity family and make him and his family feel at home. Vicar Zhang will be "vicaring" at Trinity until Summer 2011. Click here for more info about Vicar Zhang.